You are here: Home » RFID Chip Commercial!!! Will You Take the Mark…. I Mean Chip? RFID Chip Commercial!!! Will You Take the Mark…. I Mean Chip? Check out this commercial about the RFID chip that was made, I think back in 2009. If you missed the episode of Flow of Wisdom Radio where I tackled the topic of the RFID chip and how a middle school in Texas is already preparing to implement the spychip in student ID badges. 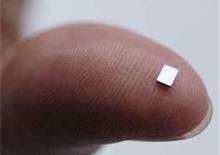 I also gave info on who produces the RFID chip, which is manufactured by a company called Alien Technology. Check out the podcast here! ← Holy Toledo!!!! Is China Buying Up Ohio? Peace, Sorry about the incorrect youtube link here is the correct link..